So, you guys should all be familiar with Jeff by now. He’s our honorary Casas Fumando writer, and he kicked out tons of great reviews. If he keeps this up we are going to force him to join us full time. Until then, enjoy his newest “Guest” review. Well, I’m back after a rather prolonged absence due to various circumstances. Thanks to Tony and Jeremy, as always, for their patience and support! Elegante 7×38, with prices ranging from $7.50 to $11.50 in boxes of 20. Surprisingly, the more difficult to properly roll lancero sized Elegante is the least expensive of the bunch. The cigars are made at the Eiroa’s Las Lomas cigar factory in Honduras. 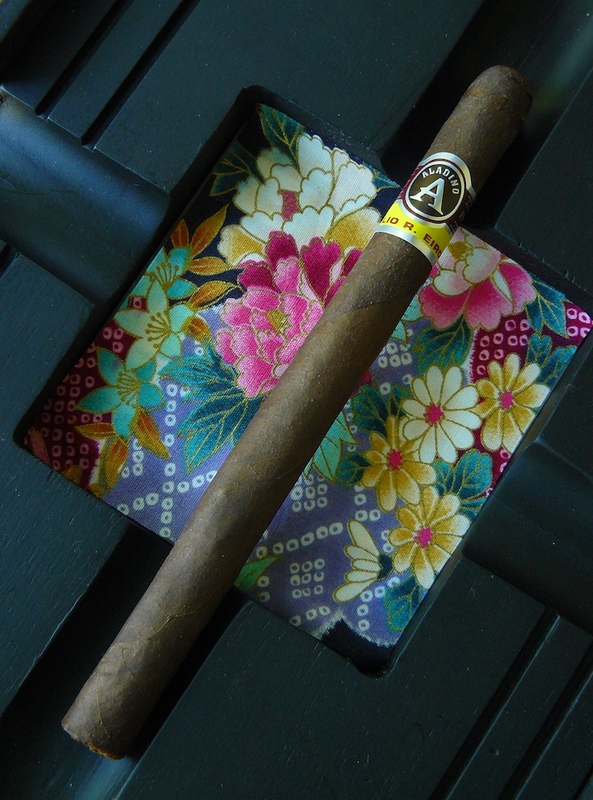 I received a couple of the Aladino Maduro to try out from our good friend Ana Cuenca at Cuenca Cigars. The Aladino Maduro Elegante comes clad in a dark brown leaf with a decent amount of oil sheen and a nice toothiness. 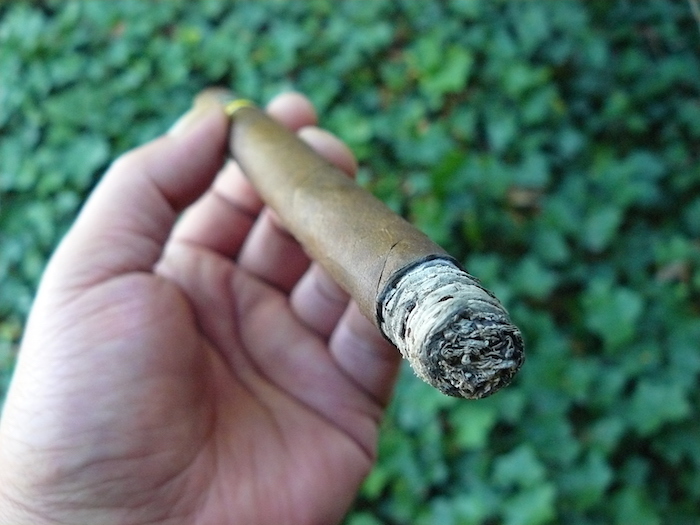 The few veins present are thin, leading to a somewhat sloppy cap, and the cigar is very firm when gently squeezed. The band is rather simple (which I like) in a color scheme of yellow, maroon, and black with silver trim. The wrapper gives off an earthy barnyard aroma, while the foot shows earth, wood, and mossy notes. An easy clip of the cap produces a nice draw that reveals little more than a light sweet tobacco note and leaves a bit of saltiness on my lips. 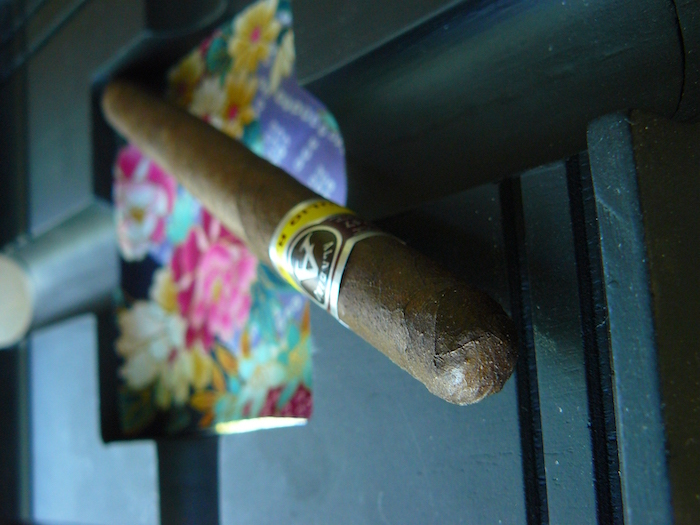 It doesn’t take much to get the Aladino Maduro Elegante lit or to get a good volume of smoke. Earthy tobacco, oak, coffee, and leather all play along with bracing black pepper and a somewhat sharp mineral finish. The burn line is razor sharp with just a slight wave, leaving an ash that gently falls and crumbles at ¾”. The pepper, as well as the leather, has backed off some, but is still quite noticeable, especially on the sinus burning retrohale, and a bit of yeastiness has appeared. Reducing the retrohale helps to smooth things out considerably. The previously mentioned flavors are all working harmoniously, with none taking clear control. 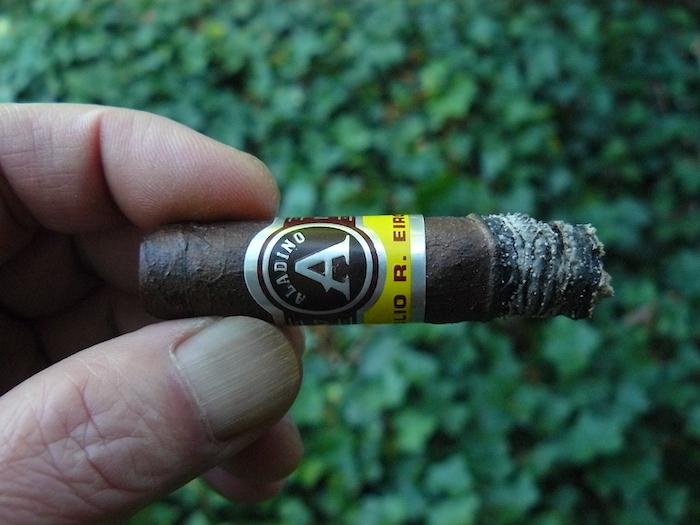 The Aladino Maduro has been burning dead-even since the first ashing and not much has changed in the flavor department – not that I’m complaining, as the combination of flavors is working quite well. Halfway through, it maintained a solid medium-plus body with not a lot of nicotine strength. The earthiness has fallen back, as the yeasty breadiness moves up. As the final section rolls around, the pepper has pushed forward, supported by the woodiness. The strength has ratcheted up as well, now coming in at a solid medium-plus as the body has reached medium-full. With a little more than an inch remaining the flavors have begun to wash out, so it’s time to put it down. The nub is cool and just a bit soft. I found the Aladino Maduro to be a very good smoke despite the lack of real transitions as it went along. The flavors were enjoyable and fairly complex, and the construction and burn were superb. I do wish it had a bit more sweetness to add to the flavor mix, but I don’t consider that to be a major drawback. With the more than reasonable price for a lancero, I have no qualms recommending it to those looking for a spicy dark smoke, although I will add that I thought the Robusto I smoked previously was a little more to my liking, as it had less of the pepper blast that helped to balance it out a bit better. 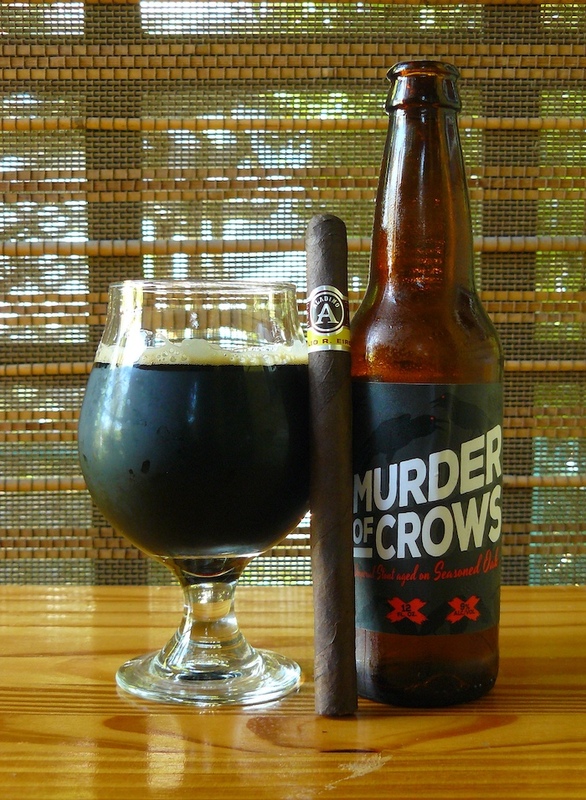 Skookum Brewery’s Murder of Crows Imperial Stout is aged on Old Crow oak cubes, boasting an ABV of 9%. Although the bourbon properties are a little understated, the flavors of prune, mocha, dark caramel, and roasty malts on a medium bodied mouthfeel are pretty damned nice and paired up quite well with the Aladino, adding a bit of sweetness and helping to tone down the pepper and sharp finish of the cigar somewhat. Just about any other stout or porter would also match up well, as would a tawny or reserve port.